I know we are all abuzz about the Born of the Gods spoilers, but today I want to address two topics that came up last week: counterfeits and reprints. Reddit and Twitter and all plenty of other folks were up in arms about the Chinese company making very high quality fakes for not much money. These were Power 9 cards, fetchlands, duals, and all sorts of old and new cards that would fool anyone while inside a sleeve. There are indications that these have been trickling onto the market already, especially via eBay. For a casual player, I recognize that the impact is minor. We tend to get cards and then keep them indefinitely. Our powered cubes, our foiled decks: these are the reason cards get scarce. It doesn’t matter much to me when cards go up in value, because it’s in a deck and is likely going to stay there. The danger comes when we want to sell out or extract some increased value. More than once in my life, I’ve sold cards to pay for needed things, like a new transmission or student loan payments. Counterfeits threaten that value, and while Wizards is taking a step with the foil stamp soon to be added in Magic 2015, this is not the last we’ve heard of this problem. To those of you who want to buy a set of power and all ten duals for pennies just so that you can have official-looking cards without the official price: shut up. You don’t understand the impact of what you are saying. A flood of indistinguishable counterfeits would be deadly, since no one would buy boosters to get cards for Standard when the counterfeits can be had for next to nothing. In happier news, we are getting Modern Event Decks soon. No word yet on what’s in them, but we know the MSRP is going to be $75. We are all still guessing at what will be included, which colors and type of strategy, but Zendikar fetchlands have been a very popular guess, even if we don’t know how many of each will be in the deck. This first event deck will be a bit tentative as Wizards figures out what they are doing. However, you should expect more of these to come down the pipeline, as they seek to reprint cards and increase the availability of certain Modern staples. Reprints have changed in a lot of ways since the early days of Magic. No longer do we have black border (original printing) vs. white border (core set reprint). Foil-only printings are a thing, as well as being able to buy a product and know for sure what cards it contains. 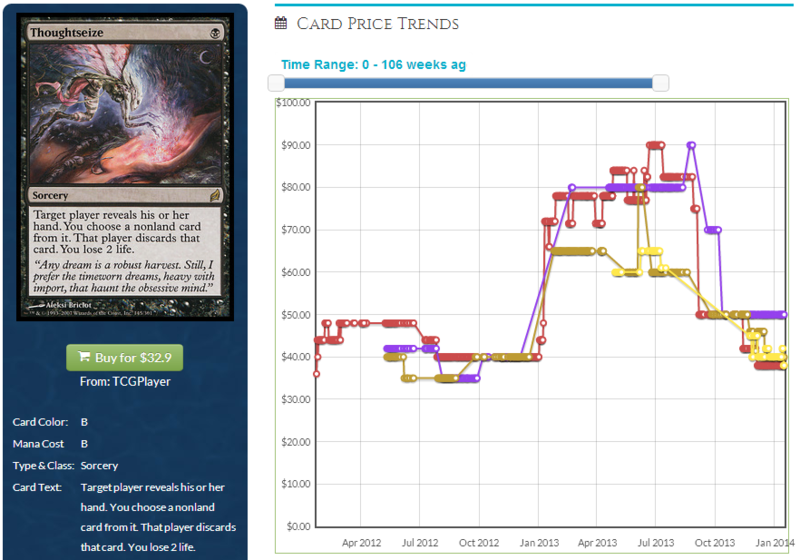 Most interestingly, reprinting a card these days doesn’t automatically cause the value of the older card to tank. This was not always the case. In the past, there was a set called Chronicles. This set was designed to increase the number of certain cards in circulation. This was 1996, and Wizards had a lot of growing pains left to do. The secondary market was ill-formed and not well-connected. We all got our prices from Scrye or InQuest. Chronicles destroyed the prices of many cards, but it’s worth mentioning that at this time, price and supply wasn’t centralized and shared online as it is now. It also needs to be noted that the summer of Fourth Edition/Chronicles/Ice Age is when Wizards finally got their logistics in line. Stores would get all they asked for, without needing to inflate their order. We have had more than a few reprints lately. Some have caused prices of originals to tank. Many more have seen the new ones be cheap, while the original stays near its pre-reprinting price. This and Dark Confidant were the banner reprints from Modern Masters, and their price hasn’t really budged. I know MMA was a limited run, but I really wish we could compare the quantities sold of MMA to Future Sight to Ravnica. Now it gets interesting. The Planechase reprint didn’t hurt the value much. Being in Magic 2014 took half its value away…but note the gap between the two older versions and the M14 version. Is it worth a few bucks to have a different set symbol and different flavor text? As one of the most unfair casual cards out there, the original was pushing $10 before it was reprinted in M12. The new one bottomed out right afterwards, around $3. But lo and behold, both the Future Sight and the M13 copies are around $8 now. Look at the graph for this card for 108 weeks. Last January it saw a big rise, reaching $80 before the reprint news. It’s back to $40, while the Theros version is just $15. The big question is how that price will change over time. We are about to embark on Born of the Gods, but Theros packs will be opened until summertime. Magic Online redemption is going to be a factor, but how much with the price changes and event entry/prize tweaks? With these examples in mind, let’s look at some likely reprints and if we should be afraid of the impact on value. Filterlands – These will get printed again. I’m not sure when, but they are from an underbought pair of sets, especially the enemy ones of Eventide. 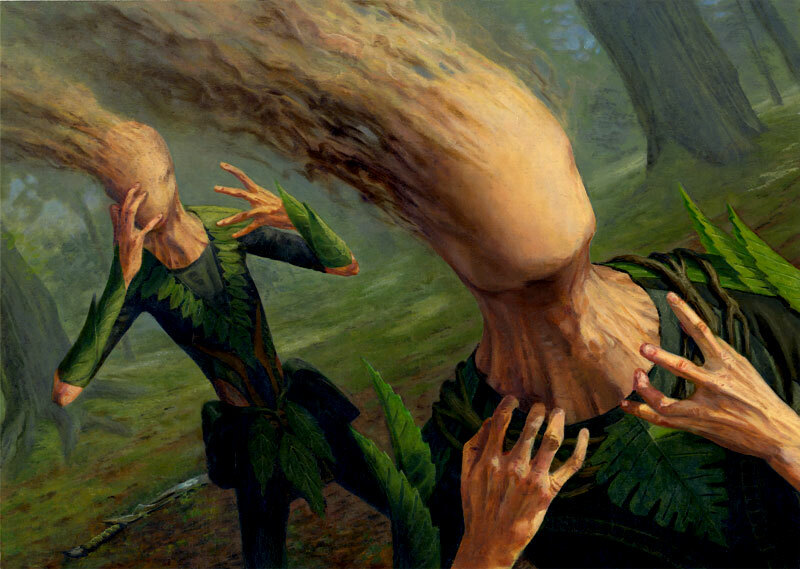 They see a little Modern play, but they are probably the best lands in casual decks for their ability to give double of a color – we dearly love big splashy spells. I’d see these taking a dip at reprinting but not by much. Grab them when you can. Zendikar fetches – At reprinting, they will lose 20% or so of their value. There’s too many Modern players who would be snapping these up to keep the Zendikar lands down for long. The casual appeal of these is also very high–we all have shocklands to fetch now! An easy call to say the price will stay stable/rise. I do not think that there will be enough Modern Event decks to meet everyone’s demand, so if these lands are in that box, the originals will at least hold their value. Onslaught fetches – I’d call these the safest of all the cards on this list. A reprint won’t hurt the prices of the originals very much, because the old frame will keep them as a more unique version. If these were printed in a Standard-legal set, I’d expect the demand to be very high at first, as Modern players added them to decks left and right. Lurking Predators – If this gets reprinted, the price will tank. It’s a fun card, but the supply will be far greater than the demand. Get only what your EDH decks need. Gauntlet of Power – Wouldn’t this be a fun addition in Theros block? Gauntlet of Power would make devotion better and easier! If reprinted, I think a lot of the price would depend on the art used. I really like the Time Spiral art. Expect this to hit $5 if reprinted, so be cautious. Darksteel plate – I was really surprised that this wasn’t in any of the Commander 2013 decks. It is a great EDH card and that’s the only place it sees play. If it gets a reprint I’d expect the value to plummet and then very slowly rise again over time. Not a safe investment. Vedalken Orrery – If you don’t want to mess with lands, this is up your alley. Do everything at instant speed! This is another card which won’t get affected by a reprint, because people are going to play the heck out of these. Another fairly stable card. Tribal lands – I mean the Onslaught ones, à la Riptide Laboratory (Look at the spread between the foil and the nonfoil!) or Unholy Grotto. If reprinted these would tank and not climb for a while. The tribal decks have theirs already, and so a new round of these lands would be lots of extra supply. Be wary. Wurmcoil Engine – even as the prerelease promo, this has an impressive price. Only Emrakul does better price-wise as a promo. This card is probably one of the best colorless creatures ever, making it an awesome fit into most casual decks. It shows up in some modern Tron lists too. I doubt this would get printed again in standard, but in a duel deck, it’ll fetch $10 pretty easily. These are a good bet to keep most of their value. The Eldrazi (Ulamog, Kozilek, Emrakul) – Amongst the most mana-intensive creatures ever, these are in demand for multiple reasons. Rise was a VERY popular set, fun to draft and packed with value. Inquisition of Kozilek is a $7.50 uncommon, simply as a budget alternative to Thoughtseize. The three giants are nearly immune to having a reprint hurt their value, as seen by the have extra copies of Emrakul (prerelease promo) and Ulamog (FTV:Legends) floating around. EDH players love the immunity to mill strategies, as well as huge monsters, so I would call these a fairly safe bet to keep most of their value if reprinted. One last tidbit today: for you Nekusar, the Mindrazer players. If you like Wheel of Fortune, don’t forget to add discard effects too, including the classic combo of Megrim and Memory Jar. In fact, the new Waste Not is going to positively sing in those decks. Enjoy! Half of these are very specific to the plane they are from, lore-wise. That would seem to limit their reprintability quite a bit. Thoughts? Akroma’s Memorial was reprinted in M12, not M13. Also, the FS price was much higher than $10 before it saw a reprint.